ATIQUIZAYA, El Salvador, Feb 5 2018 (IPS) - Eating healthy and nutritious food in schools in El Salvador is an effort that went from a pilot plan to a well-entrenched programme that has now taken off. The Sustainable Schools programme, initially launched in 2013 in three schools in the rural municipality of Atiquizaya, in the western department of Ahuachapán, surpassed expectations and has now been replicated in all 22 schools in the municipality, and in many others in the country. “With the 10 menus that we have implemented here, we have changed the student’s expectations about meals,” the director of the Pepenance District Educational Centre, José Antonio Tespan, told IPS before this year’s first parent-teacher assembly. That institution is one of the three where the programme started, and over time became the flagship of the initiative. Now it has been implemented in 10 of El Salvador’s 14 departments, and includes 40 of the country’s 262 municipalities and 215 of the more than 3,000 schools in the rural area, benefiting some 73,000 students. The project has had from the start technical support from the United Nations Food and Agriculture Organisation (FAO), and financing from the Brazilian government. And although it officially ended in December 2017, it will continue because of its success. “There was a paradigm shift and a sustainable school model was developed in Atiquizaya, it was a pleasure for FAO to have accompanied them,” the U.N. agency’s representative in El Salvador, Alan González, told IPS. 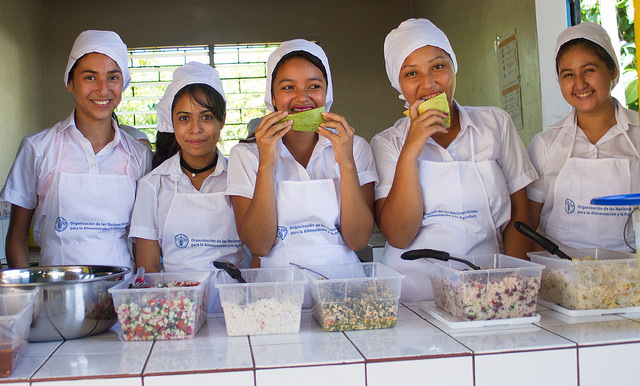 El Salvador is part of a group of 13 countries in the region that, since 2009, have taken part in an initiative executed by FAO and the Brazilian government, extending the programme of sustainable schools, adapting the achievements of that South American country’s National School Feeding Programme. This Central American nation of 6.5 million people faces serious socioeconomic problems, and child malnutrition has never been eradicated. Chronic malnutrition in El Salvador was around 14 percent in 2014, in children under five, according to that year’s National Health Survey, the most recent. That exceeds the Latin American average, which is 11.6 percent, according to 2015 data from the World Health Organisation. The students benefiting from the initiative receive a mid-morning snack, made with products purchased from farmers in the area, as part of the “local purchases” component, a key aspect of the project. “In addition to ensuring a nutritious diet for our students, at the same time we are strengthening the local economy,” said Tespan, the director of the school in Pepenance, home to 3,225 of the 34,000 inhabitants of the 67-sq-km municipality of Atiquizaya, which encompasses 13 districts (villages or small towns). The school’s cook, 46-year-old Rosa Delmy Fajardo, a native of Pepenance, mixes fruits, vegetables, and eggs with enthusiasm. Her meals have achieved the approval of the students. She told IPS that of the 10 menus, there was one she had never seen or tasted, the so-called “Chinese rice”, based on that grain, to which is added an egg cake, cut into pieces. “When I make that, they eat everything, and there are children who ask their mothers to make them Chinese rice,” she said. She added that she has been in charge of the school kitchen for 11 years, but has worked three years under FAO nutritional guidelines. Before that, the menu was less nutritious, since it only had staples such as oil, rice, beans, sugar and milk. “Now we have everything that is needed for the food to have another touch,” Fajardo said. The success achieved in Pepenance was reflected in November when it became a finalist for the Banco do Brasil Foundation Award, in the international category. The award promotes low-cost sustainable development initiatives with a major social impact that involve community participation. The categories are aligned with the 17 Sustainable Development Goals (SDGs) promoted by the UN’s 2030 Agenda. “I am overjoyed about this award, for me it is a great achievement, and I feel proud,” added Fajardo. Meanwhile, the mayor of Atiquizaya, Ana Luisa Rodríguez, said she felt happy and moved by the recognition obtained in Brazil, and hoped it would bring more benefits to strengthen the programme. “This gives us the opportunity to open new doors with other decision-makers to promote more integral projects… there are families who want a school garden, so we’re starting a project of family gardens in the municipality,” she said in a conversation with IPS. For the mayor, part of the key to the success obtained in Pepenance has been the work coordinated with all the actors and agencies that have been working towards the same end. “Having achieved this intersectoral collaboration was momentous: the parents got involved in the construction of a storehouse, kitchen and dining room, and they were also empowered, they are part of the project,” she said. For his part, the FAO’s González stressed that “in Atiquizaya the involvement by the community and local actors was vital” in achieving the result obtained. 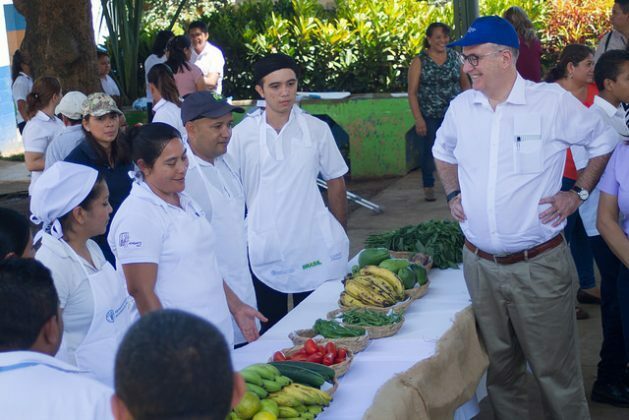 In September 2017, FAO regional representative Julio Berdegué visited Pepenance for a first-hand view of the achievements obtained, and stressed that the small Salvadoran community’s accomplishments are an example to be replicated in other countries.